Garden Estate is a relatively small estate situated in central Scotland, approximately five miles to the west of Stirling. The estate has many varied woodlands, ranging from some areas of native woodland on SSSIs to commercial exotic conifer plantations. Most of the woods on the estate are relatively small in size, although they are capable of producing very good timber, in particular, Oak. Many different species have been grown on the estate during different eras, the result being a varied composition of trees. These include many ornamental and veteran trees, both as specimen trees and within the woodlands. The current management of the estate allows for this rich woodland diversity to continue for future generations by the planting of many different and more unusual species – although traditional species are still dominant. To this end a number of plantations have been established that would normally be considered as “unusual”, such as Walnuts, Yew and Dawn Redwood. Although other uses may take priority, all trees on the estate are planted with timber production in mind. The Walnuts are no exception to this, although the desire for diversity and a curiosity as to how well, if at all, Walnuts would grow at Garden were the prime reasons for establishing a small plantation. The Walnut plantation is approximately 0.1 ha in size. It is located on the east side of the Arngibbon Glen, at an altitude of 40 m with a westerly aspect. The plantation lies on a latitude of approximately 56° N, making it one of, if not the most northerly plantations of Walnut in Europe. The western border consists of semi-mature Sycamore, while the other boundaries of the plantation consist of a mix of scrub (Hazel, Elder and Sycamore) and bracken. A power-line runs along the northern edge and a farm field along the southern and eastern edges. Scrub is kept in check due to adjacent land uses, allowing plenty of light into the plantation, while the Sycamore on the western edge and sloping ground from the east provide essential shelter. Soil comprises a fertile, relatively free draining, brown earth with underlying sandstone. A deer fence was erected around the site prior to planting, in addition all trees were protected with 0.60 m tree shelters to protect against damage from small mammals and to aid weeding operations. The plantation was established in spring 1999 withHybrid Walnut (Juglans regia X nigra), of Department de l’Isère (38) Grenoble provenance from France. Trees were planted at an initial spacing of 2.1m, an overall stocking of 2350 stems per hectare. Routine forest management operations, such as weeding, have been carried out to ensure successful establishment. No beating up has been done due to very low mortality rates (2%), although three stems were stumped back following an early frost. Formative pruning has been carried out – according to French techniques – to encourage apical dominance and reduce heavy branching. Unfortunately grey squirrel predation has occurred resulting in many stems being damaged. Unfortunately the squirrel damage, coupled with an easterly wind, has, in some cases, caused the loss of the entire leading stem. The worst damage has undone much of the pruning work, resulting in trees with several leading stems, most of which are below the height of the canopy. Despite this the canopy has almost achieved closure. Walnuts are not a widely planted forest tree, making a qualitative comparison of growth rates is difficult as no Yield Model currently exists. Anecdotal evidence, gathered from conversations with other Walnut managers, does suggest that rates of growth are very good, with the Garden Walnuts matching the best plantations in southern England. Interestingly, these plantations are planted with trees of the same provenance. 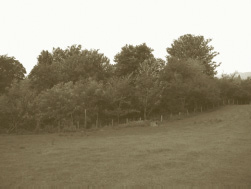 The site for the Walnut plantation was chosen as it was hoped it would provide good soils, shelter and plenty of light. Rates of growth would appear to confirm this to be the case. The importance of good site selection can easily be demonstrated at Garden as a few left over trees were planted along a nearby roadside to form part of an avenue. These trees, despite being some 20m lower in altitude and having plenty of light have not performed well. No measurable girths can be found and average height is only around 1.4 m, with the tallest being only around 2.5 m. This has mainly been attributed to a much heavier and wetter soil, although road pollution, lack of weeding and a lack of competition for light may also be factors. Traditionally Walnuts have been planted at very wide spacings, from 3-4 up to 10 m. (Stocking densities from 1100 to 100 stems per hectare). It is understood that wide spacings are required where nuts are to be harvested as a crop, however, at Garden nut production has never been a priority. The Garden Walnuts have been planted at a much higher density, at a stocking level much more resembling a timber producing forest and will therefore require early thinning. Walnut has been viewed as a light demanding species which requires to be open grown, even where timber production is a high priority than nut production. Recent research however indicates that while Walnut is a light demander it is tolerant of crown competition. Experiments with nurse species have shown that these can promote rapid early growth in Walnut plantation, particularly where a nitrogen fixing nurse species is used. The Walnuts at Garden will have benefited from a fertile site along with run off from the adjacent field, perhaps explaining rapid growth without a nitrogen fixing nurse. If the Walnut plantation is to produce any utilisable timber, early squirrel control in and around the plantation will be essential. Thinning work will also be required to reduce the density of stems and allow crown development. This may be an opportunity to remove stems damaged by squirrels. In conjunction with this further pruning work should be carried out to minimise branching and ensure that remaining trees have only one apically dominant leader. Three survey plots were marked with stakes in July 2006, and growth data recorded. These should be used as monitoring plots to assess the effectiveness of thinning operations and future growth. Older Post“Just one of those days"